I decided to brave the weather and went down to The Hub, Bodiam (Workshop Venue) to set up beside the beautiful river Rother next to their glamping site. The forecast promised sunny spells - well that didn't happen! Instead, I endured a bitterly cold north-easterly wind with glimmers of blue and light in the sky. 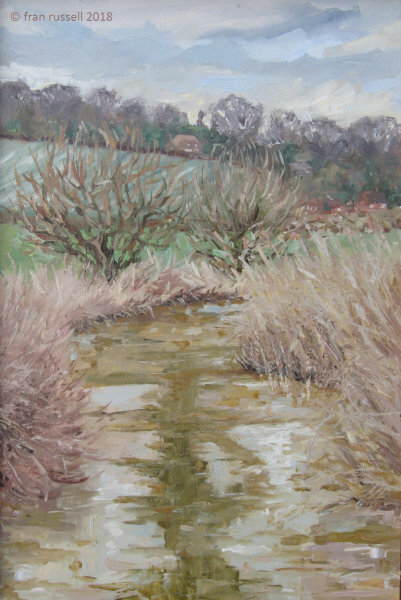 As mad as it sounds (and it was challenging to get my brush to go & stay where I wanted it) - being there was enjoyable. Afterward, I warmed myself up back at the Hub and enjoyed their fire and a hot coffee to thaw out!